Tasted at the Union de Grand Cru in London. The Branaire Ducru is slightly richer and more extroverted on the nose compared to the Beychevelle. There are copious black cherries, bilberry and cedar aromas, with a hint of Lapsong Souchang. The palate is medium-bodied with spicebox and black pepper on the entry. Good structure here: a Saint Julien that has gained a little breeding during its élevage. Very fine. Tasted November 2012. Tasted at the chateau and the UGC, the Branaire Ducru is a blend of 70% Cabernet Sauvignon, 23.5% Merlot, 4.5% Cabernet Franc and 2% Petit Verdot including 10% of the vin de presse. It has 13.8% alcohol with a pH of 3.53. The nose is very primal compared to other samples with high-toned dark cherries, dark plum and cassis. The palate is medium-bodied with fine tensile tannins, very good acidity and precision; not a wine of dimension like Ducru Beaucaillou but I like the subtle touch of spiciness interlacing the finish. Very fine. Drink 2014- Tasted March 2011. A layered young red with lots of black olives and berries on the nose. Full body, with velvety and chewy tannins. It all comes together at the end with a lovely sweet fruit. Try after 2017. Tasted 17 Feb: Very dark purple. Nice freshness on the nose. Very round and supple and polished. Opulent without being sweet. All assembled by end Feb with about 9% vin de presse. More approachable than most of the 2010s I have tasted so far. Fresh and the fruit almost disguises the marked tannins on the finish. Stricter selection than usual. Dry - very dry summer. 41 hl/ha compared to 47 hl/ha in 2009. Small berries. Tasted blind 8 Apr: Very sweet, almost Marmite aromas. Great freshness but no great intensity on the palate. A little angular with some green notes on the finish but a competent wine. Relaxed and comfortable. Not forced. 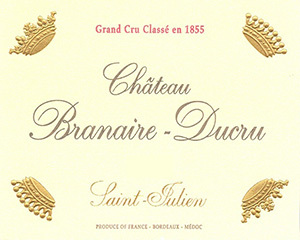 A classic Saint Julien Chateau that in recent vintages has pushed the quality level up considerably under owner Patrick Maroteaux and winemaker Jean-Dominique Videau. It produces wines of real St Julien class and structure. Made from 70% Cabernet Sauvignon, 23% Merlot, 3% Cabernet Franc and 4% Petit Verdot. The yield here was down to just under 40 hl/ha compared to 47 hl/ha in 2009. Classsic Cabernet character. Quite dry and cedary with tobacco notes. Ripe tannins and attractive blackcurrant fruit. Firmly structured, this will require 15-20 years to resolve but will make a great Branaire. The nose has lots of ripe fruit just a bit sweaty sweet. Ripe black fruits give richness on the palate slightly sticky sweet but there is enough freshness right at the back to balance the rather fleshy richness. Lots of depth and already showing fragrance and complexity, perfect concentration and refreshing, harmonious length, another great wine from the château on top of its form. Drink 2018-30.